This is just one of very many ruins in Ugolnye Kopi. There may be someone living in there somewhere… Click to enlarge. Although this is primarily a photoblog about my birding forays, it could just as well be an account of how the bird images actually happen. This blog entry is just that. I have been travelling… Haven’t I always, I hear you scream, but this time it was absolutely, totally different. For one thing I didn’t bring a paraglider. For another, I went somewhere I had never even heard of a few months ago, and you probably haven’t either, namely to the province of Chukotka in NE Siberia, right on the Bering sea. The first part of the journey there is easy – get to Moscow, board a proper Boeing 777 bound for Anadyr (pronounced AnAdyr), capital of Chukotka. Touch down 9 hours later, plus ten hours time difference, so the flight eats 19 hours of your life, so to speak. 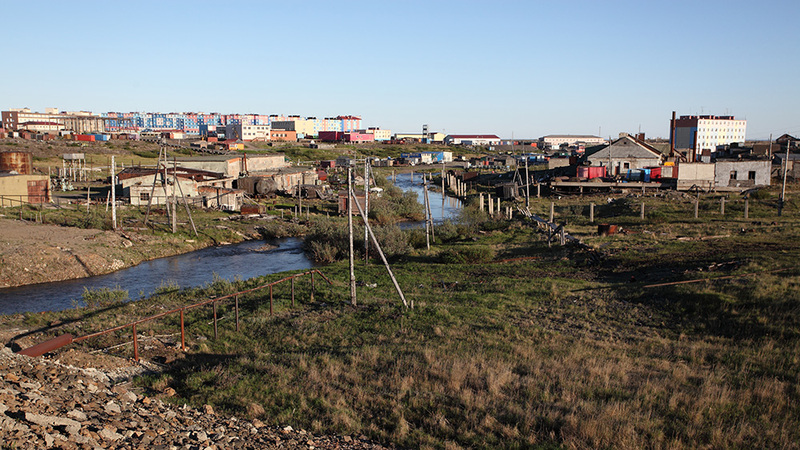 Anadyr is a town of some 13.000 souls on the absolute outskirts of the Russian state – plus it still lies a hovercraft/ice vehicle/ferry trip away from the place where the airport is located, across the Gulf of Anadyr. 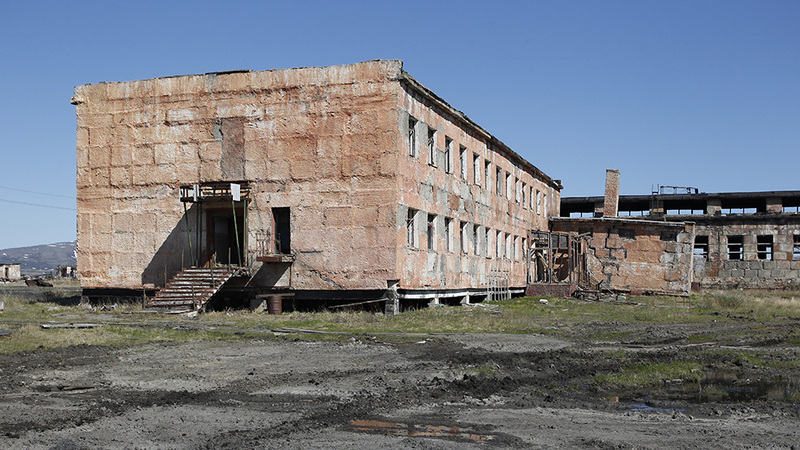 No matter, we’re not even interested in Anadyr in this adventure, so we stay on the North side of the gulf, in a barracks-come-mining town called Ugolnye Kopi with a population of some 3300. 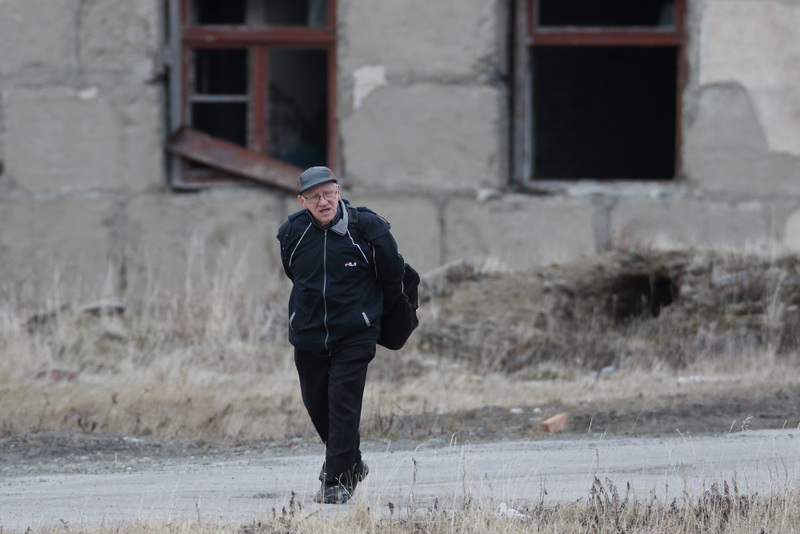 A local out for a stroll in Ugolnye Kopi. Click to enlarge. Ugolnye Kopi is without a doubt the weirdest place I have ever been – and I have been to a lot of places. It used to be home to probably ten times as many people, and the houses they inhabited, and the trash they left behind, are/is all still right there, rusting and eroding away. The majority of the urban area thus consists of ghost apartment blocks, albeit with a caveat; in many of these blocks there will be one or two apartments still occupied, giving the whole place the air of a post-apocalypse settlement, with people seemingly creeping out of the ruins every now and then. A normal European approach to things is impossible here – we’d never even let children out to play here for fear of their getting hurt in the ruins, yet the numerous young families strolling with their prams all look supremely content (and to my eyes supremely out of context) among the decay and the, well, trash. A look at Ugolnye Kopi, new part, from the road bridge that crosses the river. This light doesn’t do the desolation of the place justice. Click to enlarge. Driving caterpillars across the tundra is great as long as you don’t mind the long-lasting scars on the landscape. 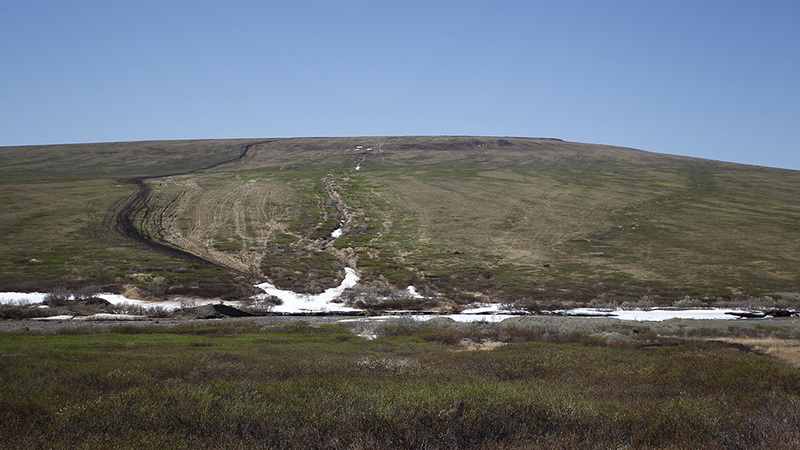 This hillside has seen much traffic over the years – an old track on the right, a newer, and deeper, in the middle, and the current one on the left. It leads to an old gold-panning location by the river in the foreground. Click to enlarge. Ugolnye Kopi is home to a coal mine, and people there seem to be either working for the army, the airport or the coal mine. There are lots of small grocery stores, a couple of schools and a post office. Many inhabitants like to go fishing or hunting in their free time, and they all seem to spend time building small cottages on skids which can be towed to faraway places by caterpillars during winter, to have somewhere out in the tundra to hang out on hunting or fishing trips. When these structures are no longer needed they are left to rot where they stand, inside the town or outside. On the other hand there is lots of construction taking place, testimony to the fact that it is far from a dying society. It just looks that way initially… Foundation work in areas defined by permafrost involves ramming long columns into the frozen ground – or, as in this case, drilling them in. Big drill. Click to enlarge. The Russians don’t believe in insulating their buildings beneath the floor, so to avoid a situation where the heat from the building thaws the permafrost beneath it and renders the foundation work obsolete, they lift all buildings off of the ground by a metre or so, meaning everything stands on short stilts. This underworld is a great place to drop empty beer bottles, cans, plastic bags etc. And the kids play in there, obviously, alongside the dogs and the “Suslik”, a large ground squirrel. 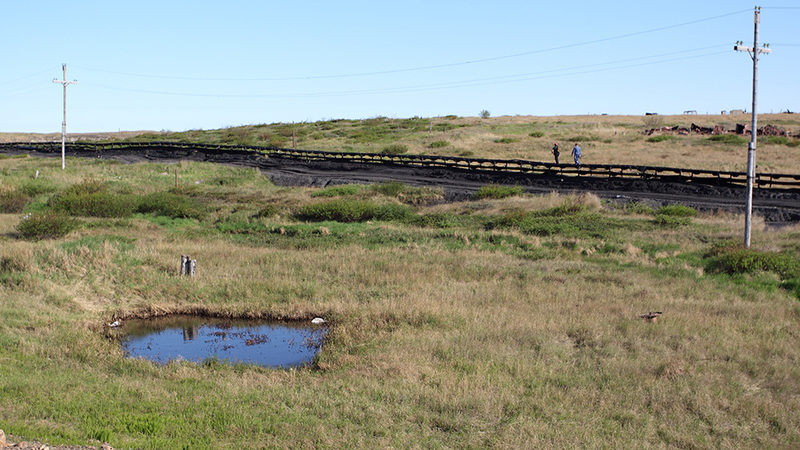 Workers walking home on the (still) conveyor belt used to transport coal from the mine to the bayside terminal, 2km away. The belt is 60cm wide and hardly dimensioned for large-scale shifting of bulk ware. Click to enlarge. The coal mine isn’t a big one – I’m guessing the mechanisation led to most of the miners getting sacked, and that was part of the reason for the decline of the population. Obviously, with the sea being ice free for just a few short months each summer, the production is stored and only shipped out in July and August. 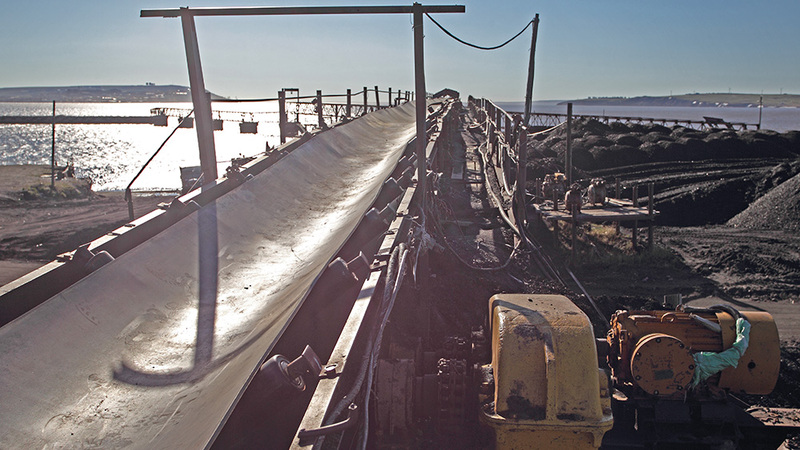 There’s a long conveyor belt from the mine to the coal terminal by the bay, but the diminutive dimensions compared to bulk mines elsewhere is testimony to the fact that this is indeed a small-scale operation. I would have liked to know if the mine was still state-run, or if it had been privatised alongside the rest of the Russian economy back in the heyday of clepto-capitalism in the nineties, but language barriers meant I never got to ask any real questions. The pier in the background is unfinished – the idea seems to have been to load the bulk carriers by conveyor belt, as it is done elsewhere, but it never happened, and for now the coal is stockpiled on the beach and loaded with bucket excavator. When we were there last week there was a floating dredge busily dredging in front of the quay so that the bulk carriers would not be grounded during loading. Click to enlarge. I would also have liked to ask the local indigenous peoples if they still spoke the language of their ancestors; they all seem to use Russian, but maybe they speak grandmother’s tongue when at home? 3 generations out for an evening stroll. I would have loved to know which language they speak among themselves. BTW the ethnic distribution is predominantly Slav in Ugolnye Kopi; other settlements in Chukotka are almost entirely populated by indigenous peoples (or so I am told). While in Ugolnye Kopi, we stayed in the local Hostel. The arrivals and departures at the airport are poorly synchronised so if you’re travelling from any of the small places around Chukotka to Moscow, or in fact anywhere, you’re bound to have a few days layover here – meaning the hostel is populated by idle men and families patiently waiting for their flights to somewhere. Rooms are generally filled to the brink, with four bunk beds in each, and 8 people on something like 15 square metres, but the rich (like us) can pay extra to get same-sized rooms with only four beds in each. In spite of a big sign on the inside of all doors here saying that alcohol isn’t allowed, many of the guests seemed to have a somewhat unsteady gait. It doesn’t help that the building has broken in two, so that to get to our room we were walking uphill regardless of which side of the corridor we were coming from. If you’re done with it, lose it. This simple rule applies to tea bags as well as 200l oil drums, or in this case empty grenade crates. There were thousands of them on this mountain top, close to an abandoned army installation. 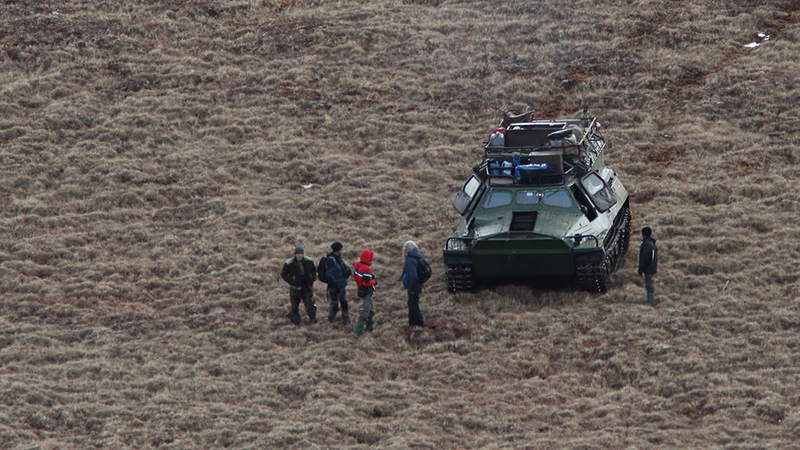 I also came across empty cartridges in the 100mm+ range – they have been practising shooting big guns up here. Click to enlarge. Chukotka is the Russian province closest to the old enemy and his border – Alaska is just 2-300km away. This means the area was heavily militarised in Soviet times, and there’s still no entry without an invitation and a permit. Even Russian citizens are turned back at the airport if they haven’t got the permit, unless they are from here. The area is full of reminders of the militarised past, with whole abandoned towns up in the mountains, and allegedly nuclear missile silos buried under the mountain tops. There must also have been an artillery firing range, as we came across this pile of discarded grenade crates. 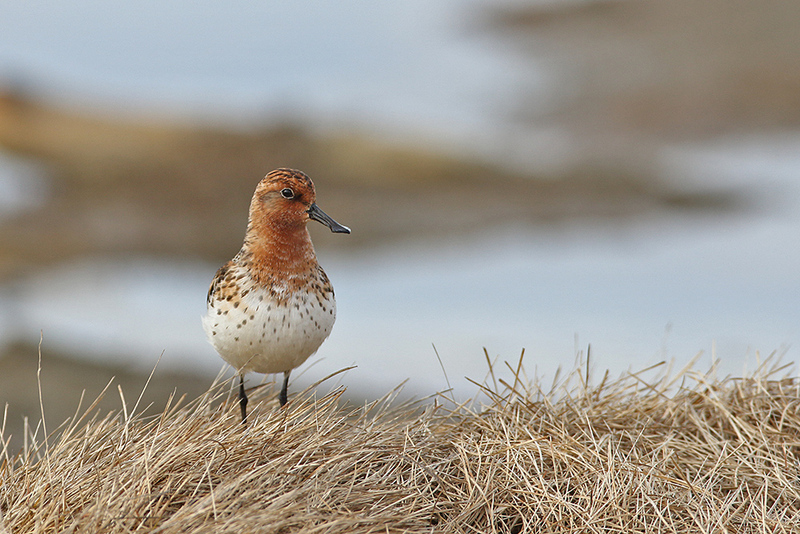 Anyway, there’s a reason why we’re here, and it is called the spoon-billed sandpiper. It is one of the rarest birds on the planet today, with perhaps just 100 individuals surviving, and they all come to this remote corner of the Palearctic to breed. 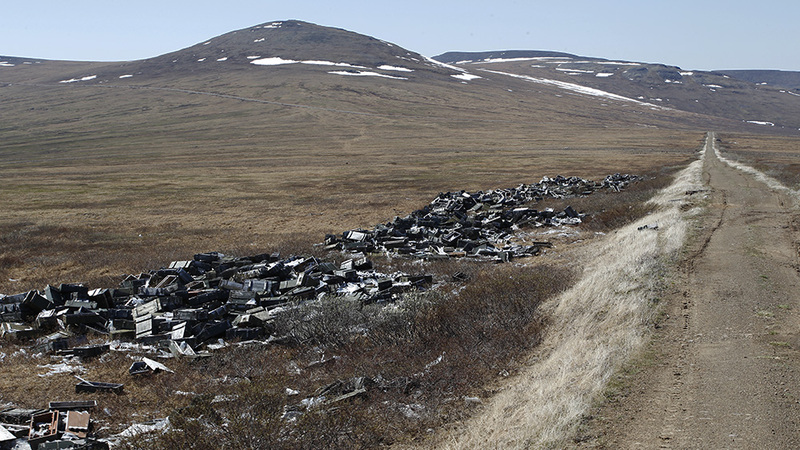 In the Anadyr/Ugolnye Kopi area there is at least one breeding location, and their benefactors, Birds Russia, is keen to have someone trustworthy visit this location at least once/year in order to keep track of the development there – in 2015, that “someone” was us: From Denmark, Jens Gregersen and myself, and from Czech Republic a team of five pros led by Mirek Salek, Prag University. SBS, characteristic shape of bill visible. So sad if the human-made World isn’t large enough to accomodate such a special little thing. Click to enlarge. Jens is a veteran of birding expeditions to Arctic regions – he as visited the Anadyr region multiple times, and knows the area better than most. Mirek has been there once before, along with one of the young ornithologists on his team, the rest of us were new to the area, and to the means of travelling. But back to the spoon-billed sandpiper, or SBS as it is called for short; it is a small shorebird with an attitude, and a super cool bill. It breeds in NE Siberia, and winters in Bangladesh, Myanmar and Thailand, some 8000km from Anadyr. 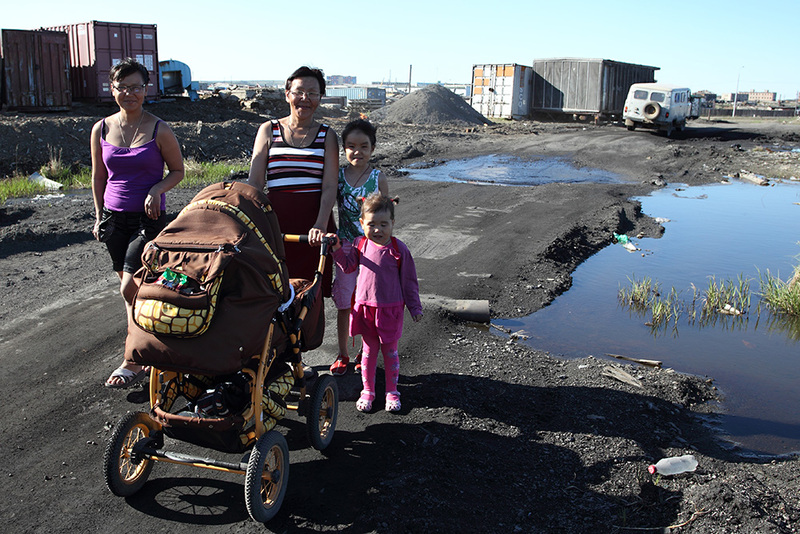 During migration it makes a number of stopovers in coastal mudflat regions of Russia, Korea and China, and it is assumed that the habitat destruction taking place at these crucial fuelling-stop places is the primary cause for the catastrophic population decline. At the current rate the species will be extinct in 5-15 years, but much is being done to try and prevent that. The infamous caterpillar, surrounded by much of the team. Click to enlarge. 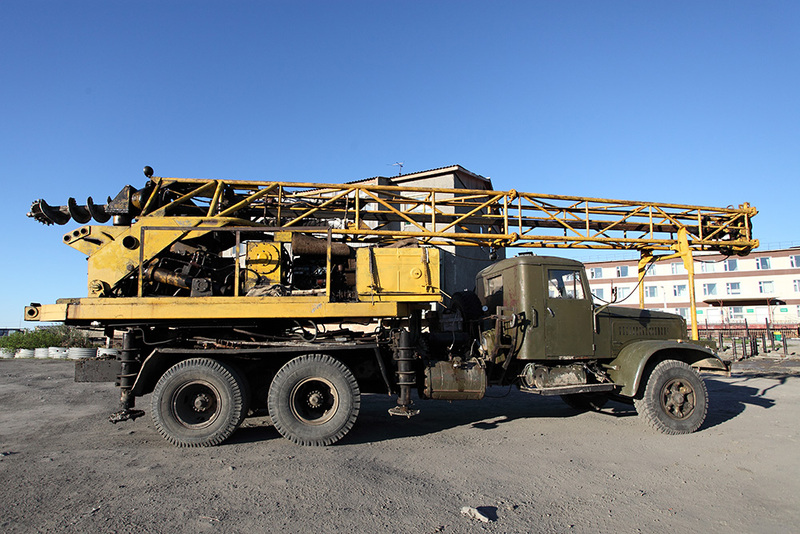 As I have mentioned above, overland transport in this area is done by caterpillar vehicle. They have the advantage of needing neither roads nor bridges, for the numerous river crossings that is. That is about all the positive there is to say about them, since any resemblance of comfort is entirely alien to such things. The noise level inside is nothing short of infernal, there are no windows nor are there seats. I sat on the roof for most of the trip, that is way better than being inside but very very far from a stylish travel means, not least because the exhaust exits at the bonnet and gets blown right onto the roof in some wind directions, and because there is no suspension meaning each bump the vehicle meets WILL try to shake roof-riders like me off. Still, we made the full trip with only minor injuries and repair stops. We spent a few days at a lighthouse by the entrance to the Gulf of Anadyr. Out there, several days’ travel from the nearest neighbours, a lighthouse keeper, his assistant and the assistant’s wife live all year in perfect solitude except when someone like us shows up. I need hardly say that they were hospitable. 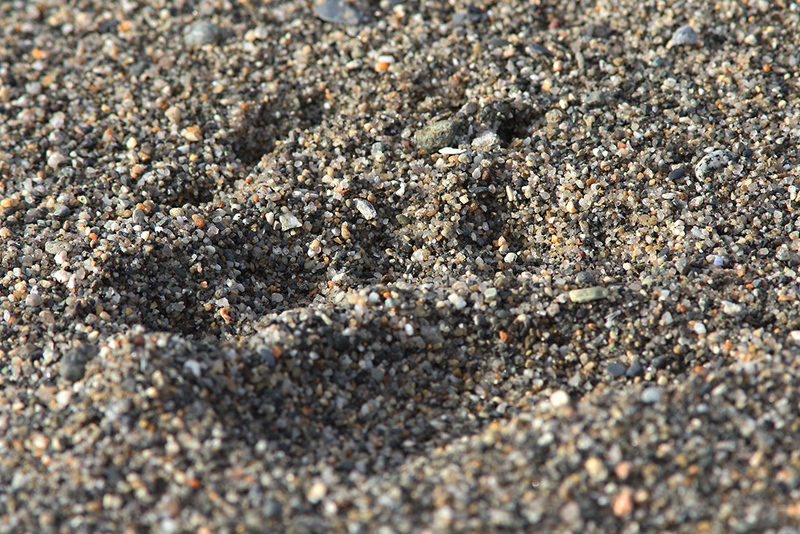 Bear track in sand. Click to enlarge. Arriving at the lighthouse, which is located at the tip of a 20km long sand spit, we found the ocean just about covered with ice all around. We also found plenty of bear tracks in the sand, apparently from a mother bear and her large cup. Sadly the bears themselves never showed up, but it was nice to be on their turf. The sea ice carried lots of seals around, both ringed and spotted. The former seems to like to hang out by itself, whereas the latter would languish on large floes in numbers, lifting their heads to appraise the danger posed by some Danish person carrying a large camera. The tip of the sand spit is also home to the rare Aleutian Tern, a pretty tern with a super strange call. There are a few breeding pairs of them around the lighthouse, but they were only just arriving from their winter quarters when we got there so we didn’t get to appreciate them much. Besides counting SBS’s we counted and estimated pretty much anything else we came across, although the pro’s were kind enough to let me wander around and do my own thing with the cameras most of the time. One of the birds that was high on their list was the elusive Great Knot (calidris tenuirostris), a distant relative of the SBS, and a somewhat closer relative of our own Red Knot (calidris canutus). I’m pleased to say that we found rather many of these birds around, and even some nests – the latter is apparently just about impossible not least with the Red Knot, and had the Czechs in celebrating mode for days. We also met the strange Wandering Tattler (tringa incana), a close relative of our own Common Sandpiper. All in all the trip was a profound success – we were able to ascertain that the SBS numbers haven’t gone down drastically in the last two-three years at this location, and we found so many other things that I can hardly even begin to recount them here. I’ll be doing more blog posts dedicated to bird photos as I get the images processed, some with just one species in them, some with a motley mix. Please come back for more, and feel free to comment below each blog post. I’ll be happy to answer questions too. Thanks for reading! Hvordan fandt I dog på det sted….? Det lyder vild at det fore går med et bælte køretøj.. Hvor mange dage var i af sted totalt. For du skriver at man skal have tålmodighed og et elastisk antal dage til rådighed..
Samt hvad koster sådan en tur ? Hej Kent uden invitation fra Chukotka kommer man slet ikke igennem kontrollen i lufthavnen, så der er ingen vej udenom Birds Russia, og formentlig Jens Gregersen, som er den dansker der har bedst kontakt med dem. Men fordi det er en videnskabelig ekspedition foregår tingene jo helt på deres præmisser, derfor den fleksible tidsplan. Det er s’mæn ikke dyrere end 3 uger andre steder, men som sagt ikke lige en ferietur som sådan. Det var dog en ualmindelig lækker professionel hjemmeside. Flot informativ tekst og meget lækker fremvisning af dine smukke fuglebilleder.